I like to think that a good body of work is like a collection of poems, each of which is a perfect thing. Collectively they make an important statement about the world and about how the photographer feels. 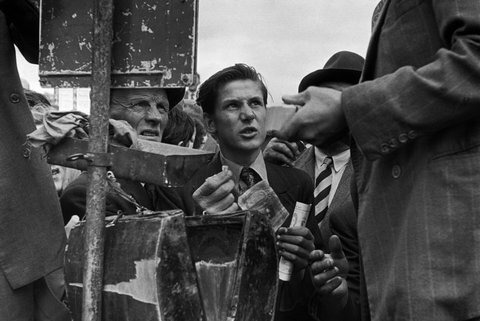 THURLES, Ireland — A horse race, 1952. Photographing for over 50 years, Thomas Hoepker has seen a world of change through his lens, from the Cold War division of his native Germany to the fall of the Twin Towers on September 11th. When rebel forces ousted Cuban dictator Fulgencio Batista, photographer Burt Glinn was there for the riotous aftermath, recording the chaos and excitement in Havana’s streets and traveling with a young rebel leader named Fidel Castro. Magnum Ireland brings together many previously unpublished images taken by more than 30 Magnum photographers recording six decades of the nation, its history, and its people. From Inge Morath's coverage of the Puck Fair to pictures by Chris Steele-Perkins and Ian Berry that capture everyday life on the occupied streets of Belfast, this book showcases Ireland and all its complexities. New York City's Times Square can be a magical place, especially when dusk settles and the brilliant neon lights illuminate it. Photographer Constantine Manos captures the tourists and New Yorkers bustling through this landmark destination.